There are more than 400,000 species of beetles and only two species of the tuatara, a reptile cousin of snakes and lizards that lives in New Zealand. Crocodiles and alligators, while nearly 250 million years old, have diversified into only 23 species. Why evolution has produced "winners" — including mammals and many species of birds and fish — and "losers" is a major question in evolutionary biology. "We found no evidence of that," said Michael Alfaro, a UCLA associate professor of ecology and evolutionary biology and senior author of the new study. "When we look across the tree of life, the age of the group tells us almost nothing about how many species we would expect to find. In most groups, it tells us nothing." Another idea, that some groups are innately better or worse at producing species, similarly fails to explain differences in species number among all of the major living lineages of plants and animals, the life scientists found. Alfaro and his colleagues studied 1,397 major groups of multi-cellular eukaryotes — including animals, plants and fungi — that account for 1.2 million species. Working as "evolutionary detectives," they were able to see whether the groups that split the earliest tended to have the most species. They assigned a "species richness score" to these 1,397 groups, using novel statistical and computational methods they developed. 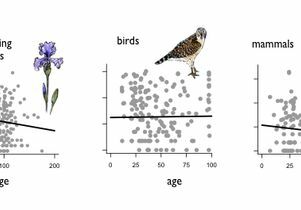 If age does not explain species diversity, an alternative idea is that a lineage will produce species up until the point that it fills an "adaptive zone" that allows a maximum number of species, Alfaro said. In other words, a lineage of bats, whales or penguins has a maximum capacity that is determined by habitat requirements and competitors. When an adaptive zone is first colonized, the growth of new species will be rapid, up until that limit has been reached. Once a zone is full, this speciation rate will level off. New species will not emerge until one of two events occurs: First, an existing species may go extinct, in which case it may be replaced. Second, a species within the adaptive zone may evolve a new trait —sharp teeth, wings, chemical defenses or camouflage, for example — that confers a significant ecological advantage and takes it into a new adaptive zone, creating opportunities for new species to emerge, Alfaro said. "Adaptive zones are an old idea in evolutionary biology, but there is little understanding of whether speciation rates or adaptive zones are more important in explaining species richness across the tree of life," Alfaro said. "If adaptive zones control biodiversity at the broadest scales, then the rate of species growth will be a good explanation of species richness only right after a lineage has entered into a new adaptive zone. Once the adaptive zone has filled up, then, no matter how much time goes by, the number of species will not change much." Thus, these adaptive zones, which Alfaro also calls "ecological limits," serve to restrict the number of new species that can emerge. "The ultimate goal in our field is to have a reconstruction of the entire evolutionary history of all species on the planet," Alfaro added. "Here we provide a piece of the puzzle. 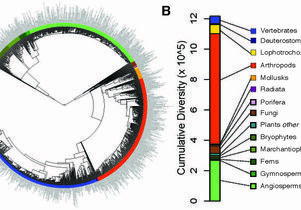 Our study sheds light on the causal factors of biodiversity across the tree of life." 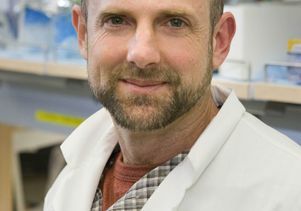 Daniel Rabosky, an assistant professor of ecology and evolutionary biology at the University of Michigan–Ann Arbor is the lead author of the study, and Graham Slater, a National Science Foundation–funded UCLA postdoctoral scholar in ecology and evolutionary biology, is a co-author. The research is funded by the National Science Foundation and by the University of California's Miller Institute for Basic Research in Science. In a 2009 study published in Proceedings of the National Academy of Sciences, Alfaro and his colleagues reported that mammals and many species of birds and fish are among evolution's "winners," while crocodiles, alligators and a reptile cousin of snakes and lizards known as the tuatara are among the "losers." That study also showed that new species emerge nearly as often as they die off.